You may find the answer to your questions below, but if not, please feel free to call or email our office and our experienced Function Co-ordinators will be happy to help. Do I have to be a member of the Club to book a function? No, Club Langley holds a full LBB Premise Licence for the retail sale of alcohol for consumption on the premises to the general public. To adhere to the conditions attached to the licence schedule clients booking a function must provide photo ID, proof of address and fully complete the booking form with one of our Function Co-ordinators. So long as this criteria is met any member of the general public can book a function with us. Can I bring own drinks? You will not be able to bring in any alcoholic drinks of your own, except wines and champagne and for this option a corkage charge applies. If you have any questions or worries on this at all, please speak to a Functions Co-ordinator. Do I have to clear up at the end of our function? No! That’s the last thing you would want to do at the end of a great party. Just take away anything you would like to keep or ask us to store it until your collection the next day. Can I use my own table linen & chair covers? No. Our amazing room decorator Elaine at Designer Bows will iron & steam on our linen and chair covers for a crisp finish with the chair bows tied precisely. This needs to be done quickly and efficiently to allow time for you to lay the tables with your flowers and decorations and our glasses. At the end of the function, the cloths and chair covers are removed by us. You can use your own disposable cloths if you prefer, but not linen. What time can I gain access to the hall and can I set up the night before? You can have access to the Banqueting Hall or Function Room for decorating before your event. We will advise you of your set up time. Unfortunately you will not be able to decorate the halls the night before. Are you licenced to hold my wedding ceremony in the banqueting hall or Function Bar? Yes, Bromley Registrars will be able to marry partners here in a wedding ceremony. You can have your wedding and reception all under one roof. Our purpose built Garden Room is licenced for your ceremony, smaller ceremonies are held in the Function Bar. I have the romantic idea of a late wedding by candlelight, how late can the ceremony be? 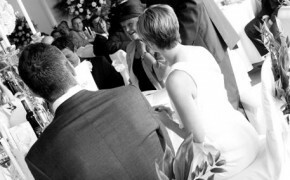 Bromley Registrars are able to offer evening wedding ceremonies. We are open to your ideas and suggested ceremony times. At present Bromley Registrars will perform a ceremony as late as 8pm. Imagine the romance of a candlelit Christmas or New Year’s Eve wedding – our first NYE wedding was held in 2016, we had another in 2017 and another booked for 2018! Why do I need to pay a refundable deposit by card 6 weeks before my function? The refundable deposit is in addition to any other fees. This is to be paid by bank transfer only (BACs) and returned within 7-10 days following your event. We are a licenced premises and guests are not permitted to bring in any alcohol or drinks except pre-arranged wines, for which there is a corkage fee payable. You will lose your refundable deposit if alcohol is found or all the terms and conditions of hire are not met. Can I have a 16th or 18th birthday party, and what about ages 21 to 25? Our licence doesn’t permit us to hold 13th, 16th or 18th or teen birthday parties. We are licensed to hold 21st s, ID required. For ages 21-24, you will need 2 doormen at a cost of £200. The door security must be from our approved company who are First Aid trained. Their presence enables you and your friends to relax and enjoy the night. Why do you need to see a copy of my ID? When you make a booking we need photo ID such as your driving licence or passport. We will also need proof of your address such as utility bill. This is necessary under the terms of booking and once the party is over, the evidence you have given will be destroyed. Can I apply for a late licence? In certain circumstances you can. On a Friday and Saturday you can apply for an additional half an hour on the bar till 2am. Occasionally by special request, a licence known as a TENS is available which needs to be approved firstly by Bromley Council. This must be done at least two months before the function and we have very limited availability and there is a fee for this. Can you suggest table wines and welcome drinks and can we set up a TAB? You can pre-order wine for the tables, soft drinks and a toast, our Function Co-ordinators will help you decide. A TAB is easily set up at the bar with your credit/debit card, you choose how much you want to spend, you can even have control over what is served, typically no shots or doubles. Can I see samples of your chair covers & bows & how much do they cost? Our chair covers are provided by Elaine at Designer Bows and come in various colours & designs. There is a wide range of coloured bows in satin, organza, taffeta or even lace and hessian. Each chair costs £3 and these will be fitted perfectly by Elaine. Elaine has an adjustable easel available to hire. Favours, placecards, tealights, table sprinkles etc – when can I bring these in? We have a storage area available with the banqueting hall, for use 2 days prior to your event and on the evening of your event. All items must be collected by 10am the day following your event. Elaine at Designer Bows can put out placecards and decorations at your request* (*additional fee applies). If I want a bouncy castle is this possible? Due to the delicate lighting in the Banqueting Hall we cannot allow a bouncy castle inside. You can have a castle in the garden, max 12×12 ft. Our Function Bar will house a small ball pit or children’s soft play equipment only as it has a very low ceiling. Children and babies are welcome, do you have highchairs & baby changing? We have four highchairs and a baby changing table with nappy bin. We can make up jugs of squash for the children and have plenty of soft drinks available. What size are your round tables and how many do they seat? Our tables are 5ft round and seat 8-9 people or 10 at a squeeze. Long tables can be put together to form a top table. The top table can be in front of the stage, bar or the most popular choice is in front of the doors so your guests look onto the garden. Buffet tables are 6ft x 2.5ft each. We can fit a total of 18 round tables (seating max 10 each) plus long top table in banqueting hall. Can we use selotape, bluetac, tea lights and candelabras? You can use these on the glass or mirrors only, not doors or walls. You may lose you refundable deposit if the walls are damaged by your decorations, please don’t take the chance with blue-tac. You can have tea lights if in holders and candelabras as long as there is something underneath to catch the wax as it drips, such as a mirror.